What is Nosocef Injection (Ceftriaxone) used for? 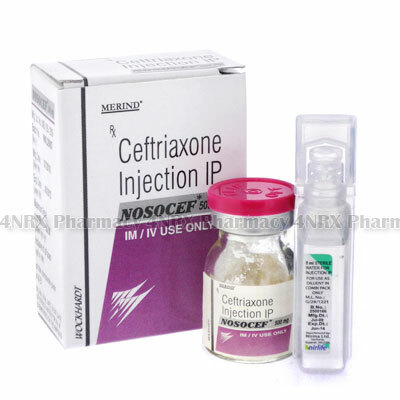 Nosocef Injection (Ceftriaxone) is an injectable cephalosporin antibiotic prescribed to treat bacterial infections including serious or life threatening infections. The medication operates by slowing or stopping the reproduction of bacteria cells making it easier for the immune system to eliminate the infection. This makes it useful for treating conditions such as pneumonia, bacterial meningitis, bacterial blood infections, bacterial infections following surgery, or bacterial infections of the skin or soft tissues. Your doctor may also prescribe this medication for the treatment of other unlisted conditions. How should I use Nosocef Injection (Ceftriaxone)? Nosocef Injection (Ceftriaxone) is normally administered by your doctor or a fully trained health care professional in a hospital or clinic. If you are required to perform your own injection, make sure you are fully instructed in the correct procedure to prevent serious complications that may occur. Your particular dosage will be determined by your doctor based on your age, weight, current health, the condition being treated, and the severity of your symptoms. To administer the medication sterilize the needle and injection site, collect the prescribed amount of medicine into the syringe, remove any air by holding it upright and pressing the plunger until a small amount of liquid is released, and slowly inject the medicine into a muscle or vein. Always observe the solution prior to each use to make sure it is not cloudy or discoloured as this may indicate contamination. Ask your doctor any questions you have about using the medicine to ensure the correct administration. What are the side effects of Nosocef Injection (Ceftriaxone)? Stop using the medicine and consult your doctor immediately if any serious side effects occur including fever, flu symptoms, sores appearing in or around the mouth, sensitive skin, easier bruising, urinary retention, severe pain or swelling of the injection site, intense diarrhoea that is bloody or watery, darkened urine, discoloured stools, jaundice, or severe skin reactions. These conditions may require lower doses, reduced application frequency, or emergency medical attention in serious cases to prevent further health problems from appearing. Nosocef Injection (Ceftriaxone) should not be administered to patients who are less than one month old, allergic to cephalosporin antibiotics, who have had a bad reaction to similar treatments in the past, or who have had an immediate intense reaction to penicillin antibiotics. Also disclose if you are allergic to penicillin antibiotics, on a controlled sodium diet, or have severely decreased kidney or liver function. These conditions may result in unexpected health problems requiring adjustments to your regimen. Strictly use Nosocef Injection (Ceftriaxone) as prescribed and follow all instructions provided by your doctor. Safe, suitable, and optimum dosage can vary and is dependent on the patient`s health and medical history, as well as the condition you are treating. Nosocef Injection (Ceftriaxone) may not be safe or suitable for all patients. Always ensure your doctor is informed if you are pregnant or breastfeeding, using any other type of medication (including non-prescription medicine, vitamins, and supplements), as well as if you have any allergies, other illnesses, or pre-existing medication conditions.